Motor Life - American car magazine from 1958. Homepage. 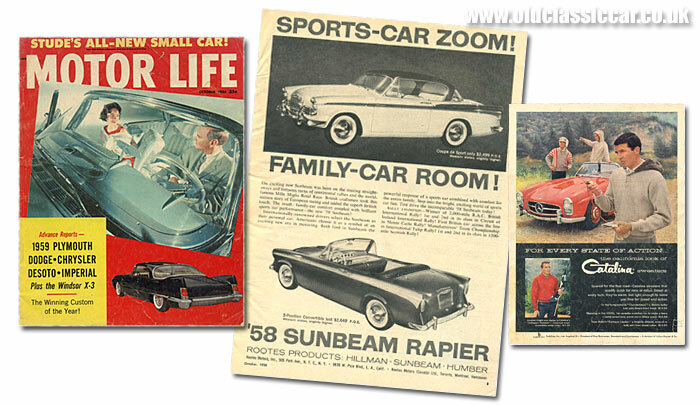 This page: An automobile magazine from the USA, dating to the late 1950s titled Motor Life. Motor Life magazine, October 1958. Buyers and owners of motor-cars in the UK had quite a choice of titles to choose from, Autocar and The Motor being perhaps the most popular choices. Drivers in the States had their own large selection of magazine titles to choose from, some of which already get a mention in this car magazines section. Examples include American Automobile Digest, Foreign Cars Illustrated and The Maryland Motorist. Like my issue of Foreign Cars Illustrated, the edition of Motor Life featured on this page also dates to 1958. Costing 35 cents, the cover promises articles on a brand new Studebaker, the 1959 Plymouth, and updates from Dodge, Chrysler, Desoto and Imperial. The winner of a "best custom car" would also be announced, and a sneak preview of an Italian-designed wonder in black is shown on the cover. Note the swivel seat being demonstrated by the young lady photographed in a '59-year Plymouth Sport Fury. Open the magazine and you'd expect to be confronted with a plethora of American automobile advertisements, and yes there are certainly plenty to choose from throughout this issue's 82 pages. However the first car advert is for a very un-American machine, albeit inspired by American styling trends of the late 1950's. The new Sunbeam Rapier "Coupe de Sport" and "3-position Convertible" take pole position in this issue, facing a full-page ad for Du Pont New Car Wax. Sunbeam Rapier Coupe de Sport. The 1958 Rapier was "... born on the roaring straightaways and tortuous turns of continental rallies and the world famous Mille Miglia Road Race". Rootes Motors Inc. were located on Park Avenue in New York and also in Los Angeles, tasked with promoting Hillmans, Sunbeams and Humbers to American motorists more used to capacious cars dripping in chrome, powered by large V8s, and adorned with ever-growing rear wing fins as the 1950s rolled along. What they'd make of this compact European offering I'm not sure, although there was no denying its sporty pretensions after successes on the British International Rally, the Monte Carlo Rally, and class wins in the Scottish Rally to name but a few. Speculation regarding a new-for-1959 Studebaker. Following on from some editorial comments, the letters page, and some technical Q&As, the reader lands upon an article describing a brand new Studebaker that was being designed by Studebaker-Packard staff at South Bend. Designers involved with this new "economy" car were evasive whenever they were directly questioned about this new design. The article therefore is a piecing-together exercise of clips read in other magazines, odd facts dropped into conversation by those involved with the project, and a certain amount of guesswork on the part of Motor Life's writers. Full-sized models of the new car were, they believed, in existence locked away behind factory gates, but reporters had yet to clap eyes on the car. Studebaker had been losing money since 1954 so were banking on the new compact being a success, and 1959 would see the Lark launched to the motoring public. Excessive ornamentation was gone, the Lark designed more with economical motoring and sensible gas mileage in mind. In fact it would steal a march on the introduction of similar products from GM, Ford and Chrysler, but as soon as the Big Three had their compacts ready and in the showrooms, sales of the frugal Stude began to wane. Production continued until 1964, the year that would see the firm close its doors for good. Other new developments for 1959. Several pages were given over to new developments in Chrysler's model line-up. The 1959 car would be an evolution of the 1958 models, with four series scheduled to be on offer: Savoy, Belvedere, Fury and Sport Fury. Big changes were introduced to the car's styling, and much was made of the novel swivelling front seats fitted to the '59 cars. Chrysler were evidently proud of this new feature, stating that these seats were "... the most significant development in automobile seating since introduction of power seat adjustment". Although not a new idea as such, their benefits when it came to entering and leaving your parked car were clear. Each seat could swing through 40 degrees of movement. Swivel seats would be standard fit in the Plymouth Sports Fury, the De Soto Adventurer, and the Chrysler 300E models. Buyers opting for a Dodge Custom Royal, De Soto Firedome or Fireflite, and any of the Chryslers or Imperials could choose these seats from the options list. Station wagon buyers though had to make do with conventional seating. 1959 De Sotos were due to benefit from new, larger engines, and much-revised styling touches that still incorporated the inevitable wing fins. The most powerful engine would be the 383 cu in Adventurer V8, similar to Dodge's Super D-500 and Chrysler's X3. Chryslers too would undergo many revisions for the new season, with some extra gadgets joining the party. Concessions to occupant safety were beginning to make themselves felt, although references to the self-dimming rear view mirrors and padded instrument panels on some Plymouths play second-fiddle to the eye-catching styling updates that were taking place. Torsion-Aire, a new optional air suspension system suitable for the back end of some Chryslers, would also make its debut in '59. Custom cars get some good coverage in this issue of Motor Life, many pages being given over to the winner of this year's contest, a much-modified 1955 Chevrolet built by Bill Carr and George Barris. Second place went to a much-modified '55 Buick, and third to a '56 Mercury. Other cars making the final list included a re-worked '55 Corvette, something called the Experimental X-2, various Fords, a strange-looking T-Bird, and a pig-ugly Chevy pickup. European cars then take their turn in Motor Life's spotlight, beginning, on page 52, with a look at the be-finned Ford Taunus 17M from Germany. Looking like a stock American car that had shrunk in the wash, the car's appearance did receive some agreeable comments from the road test team. Four versions would be imported - a Standard two-door saloon, a De Luxe two-door, and a De Luxe four-door saloon. There would also be a Combi-wagon estate car. The Taunus came with a column-change gearbox as standard, although there was an option of an automatic - "The Saxomat automatic clutch might prove a boon for lady drivers who have trouble shifting gears with a manual clutch and for those who just plain don't like to use their left foot". In summary, they thought that the 17M Taunus would sell well in the States thanks to its sound engineering, and decent range thanks to good fuel economy and a 11.9 gallon fuel tank. Coinciding with the leading advertisement for the Sunbeam Rapier, there follows a road-test on pages 58/59 where the 91.2 cu in Sunbeam was put through its paces. Testers were impressed by its American-esque styling, fins, comprehensive instrumentation and sturdy "hardtop two-door sedan" coachwork that had a noticeable lack of squeaks and rattles. The switch from a column- to floor-mounted gearshift also drew praise, and their belief was that it could definitely appeal to anyone looking for a quality import that combined a decent turn of speed, a comfortable interior and attractive exterior lines. Just as familiar to British readers as the Sunbeam Rapier was the Lodge Spark Plug, an advertisement for which appears on page 77. Distributed in the US by the Auburn Spark Plug Co. Ltd. of Auburn, New York, the British plugs had achieved excellent results in tests where a car that had covered some 18,000 miles, still had plugs that looked like new. A second advert for Lodge Plugs, giving a supplier's address in California, appears on page 81. "Those who know buy the best - Lodge - World's Finest Spark Plug". Alken sportscar body to suit the VW chassis. Bored of your VW saloon? then The Alken Corporation of Venice, California, may have had the answer. For $1295 they could supply a complete replacement body in fibreglass to suit the VW Beetle chassis, transforming the dumpy saloon into a low-slung rear-engined sportster. Less than 20 hours work would, apparently, see any Beetle transformed into a two seat convertible that came with roll-up windows, factory heater, bucket seats and a removable hardtop as standard. The only extra part you'd need to buy was a windscreen, lifted from the 1951 - 1955 Ford Consul or Zephyr. Chassis parts, such as the braking system and clutch, remain untouched throughout the body conversion. Were many of these sold I wonder? An interview with designer Howard Darrin, a look at flat-6 engines, and a feature on the 1959 Dual Ghia - a car comprising coachwork from Italy propelled by Chrysler running gear - can also be found within Motor Life's pages. At first glance the ad on the rear cover looks like a promotional piece for the Mercedes Benz 300SL, but it is in fact advocating "the California look" of Catalina sweaters, ".. geared for the fast road - Catalina sweaters that qualify quick for race or rallye". A dark-heared chap, stopwatch and driving gloves in hand, looks on earnestly, while wearing a $15.95 "Thunderhead" jacket. His buddy, in crash helmet and stripey sweater, chats in the background with the dame standing in the SL.